At least two people have been killed and several others injured in clashes near Venezuela's border with Brazil, local media report. 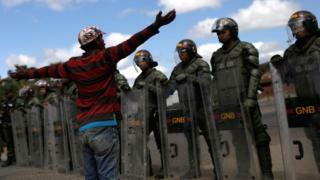 The incident came as thousands attended two rival concerts on either side of a bridge linking Venezuela and Colombia. Opposition leader Juan Guaidó, who declared himself interim leader last month, attended the Colombian concert along with several Latin American leaders. Should Branson 'back off' from Venezuela? A local woman and her husband were killed (in Spanish), according to the human rights group Kapé Kapé. Venezuela is in the grip of a political and economic crisis. The country's inflation rate has seen prices soar, leaving many Venezuelans struggling to afford basic items such as food, toiletries and medicine. Mr Guaidó says a lack of basic items has left thousands of others at risk of dying. The concerts, being held just 300m (980ft) apart, represent two opposing sides of a power struggle between President Maduro and Mr Guaidó, who is recognised as the country's interim leader by dozens of countries, including the US and most Latin American nations. It was held near the Tienditas bridge crossing on the Colombian side of the border at Cúcuta. Organisers invited 32 artists including Latin stars Rudy Mancuso, Juanes and Despacito singer Luis Fonsi, and Swedish DJ Alesso. A few celebrities - including Venezuelan-American singer and actress Lele Pons and Venezuelan singer Danny Ocean - and politicians took part. Among them were the presidents of Colombia, Chile and Paraguay, along with Mr Guaidó who defied a travel ban by President Maduro. Image caption Chilean President Sebastian Pinera, Colombian President Ivan Duque, Venezuela's opposition leader Juan Guaido and Paraguayan President Mario Abdo Benitez all attended the Venezuela Live Aid concert. "This concert is a humanitarian concert; every country, all people in the world want freedom," Mr Branson said. "Anybody that does anything for the right reasons is always going to get criticism. The positive thing is that 99% of people around the world are embracing what is going on here today." YouTube, Bing and Google services were all temporarily blocked in Venezuela during the Live Aid concert, according to Netblocks - a non-governmental organization that tracks internet blackouts. Following news of the event, President Maduro promised to hold a rival concert on the Venezuelan side of the bridge - a three-day festival which has been dubbed Hands Off Venezuela. 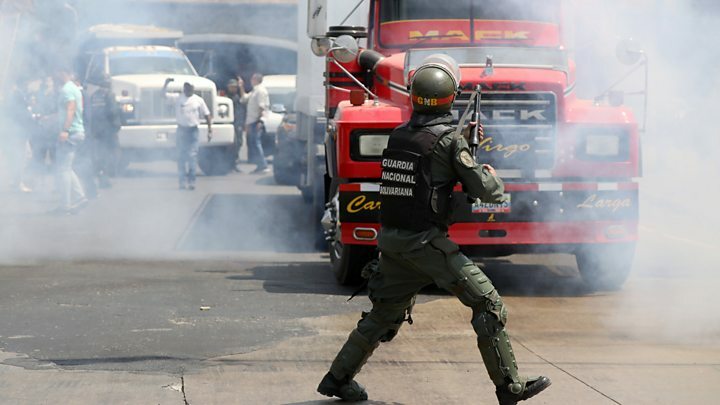 What's going on at Venezuela's borders? Brazil, which recognizes Mr Guaidó as Venezuela's legitimate leader, had previously vowed to make humanitarian aid available in the Brazilian city of Pacaraima, to be collected by opposition supporters. Moscow has accused Washington of using aid as a "convenient pretext for conducting military action." According to RIA Novosti, Russia's foreign ministry spokesperson Maria Zakharova told reporters that "in preparation for the provocation", America was deploying "special forces and equipment near Venezuelan territory." It is not yet clear. Mr Guaidó has said he plans to get aid into the country on Saturday by urging Venezuelans to mobilise en masse and form "caravans" and a "humanitarian avalanche" at the borders. A spokesman for Mr Branson told the BBC that he was working with the Colombian entrepreneur Bruno Ocampo to organise the concert and sort out the logistics while Mr Ocampo said the details "remain confidential".